Among the rareties in the upcoming auction are Paul Stankard’s 1984 Morning Glories, at left; an antique Baccarat blue primrose star-cut paperweight from the Rubloff Collection, top right; and a Baccarat Napoleon III with red and white torsade faceted weight, also from the Rubloff Collection. Rare paperweights, many from the 19th century and held in private collections by prominent Chicagoans, will be auctioned off this week. Now Scott and other enthusiasts will have a once-in-a-lifetime chance to buy such fine-art glass examples, many from the 19th century, from the Art Institute. The pieces have been held privately for decades. Nearly 400 paperweights will be auctioned in lots of two to four pieces, with minimum bids of $500 to $1,000 and values of $15,000 or more. Each lot has at least one item originally collected by Chicago real estate developer Rubloff, who donated 1,200 paperweights to the Art Institute in 1978. Also included in the auction are pieces once owned by prominent Chicagoans Potter and Pauline Palmer, Ella Grace Burdick and Lucy K. Kretchmer. Venetians were the first to create fine-art glass paperweights, displaying them at the Vienna Industrial Exposition of 1845. French glassmakers—Baccarat, Clichy, Pantin, Saint Louis—took note and, competing with each other, are considered to have created the world’s most beautiful and colorful presse-papiers. These objects were given as gifts and used as fashionable desk accessories from 1845 to 1860, when the fad ended. It wasn’t until the 1950s that French glassmakers resumed production, though the paperweights have been made elsewhere in Europe and the U.S. “It’s been this lost art, and then there’s this blossoming coming out of France,” Scott says. Today, artists such as Paul Stankard, who lives and works in Mantua Township, N.J., continue the flamework tradition, encasing in clear orbs seemingly real glass compositions from nature. The not-for-profit live auction on Sept. 17 will be handled by L.H. Selman, a gallery and auction house in Chicago that deals exclusively in fine-art glass paperweights; the hammer price of each piece sold by the Art Institute will go to the museum; the buyer’s premium will go to Chicago-based Glass Paperweight Foundation, which promotes the awareness of paperweights as an art form. 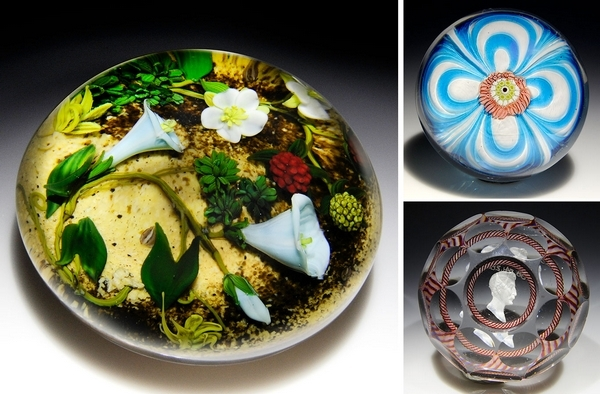 Fine-art glass paperweights are typically sold through dealers. Selman, for example, sells from its South Michigan Avenue gallery and research center, and through slow-close online auctions held three times per year; prices range from $75 to $250,000. This live auction will attract several hundred people, including buyers from Europe and South America as well as phone bidders from Japan, China and India, says Ben Clark, co-owner of Selman. The auction will be held offsite, at 900 S. Clinton St.
Clark and his brother, Mitch, bought the business from Larry Selman in 2009 and moved it from Santa Cruz, Calif., to reach a broader client base. Larry Selman is credited with formalizing the paperweight marketplace in the 1960s, using auction catalogs to track and set prices. This entry was posted in Artists, Auction, Blog by Ben Clark. Bookmark the permalink.